Could Open Government initiatives help drive innovation in Singapore? First, there was an interesting discussion on open government with Silona Bonewald, founder of the US League of Technical Voters, on the IT Conversations Network. Then the storm-in-a-teacup over a prematurely leaked LTA OPC announcement. Tim O'Reilly made a convincing summary of the state of play and call for action in his recent O'Reilly Radar presentation at OSCON (and blog post Gov 2.0: It’s All About The Platform). Don't just use our voices to "shake the vending machine"; as technologists we should lend our hands to help prove that open is indeed a better strategy for Government. The President's CIO Vivek Kundra has since even outlined a vision where the default setting for information created by the government should be public, not secret. President Obama is racking up some serious credibility for being able to push innovation and adoption in government, and raising the stakes for Governments the world over. As someone who has adopted Singapore as their home, my first reaction was: "it could have been us". It chaffs to see Singapore's world-leading ICT adoption not always translating into world-leading technology innovation and service enhancement. To be fair, Singapore's iDA Infocomm Adoption Programme and the iGov2010 Strategic Plan encapsulate many of the right sentiments. The issue is timing and rate of change. But for that, Prime Minister Lee Hsien Long could easily have stolen President Obama's thunder. But I guess the glory of being first isn't the point. Each government must run it's own race, with the focus being on sensible, timely initiatives to improve citizen engagement and stimulate innovation, the economy, and civil society in general. Promote local innovation and technology development by giving priority to "Open" in all Government data initiatives. Case in point: Did you know that you cannot hyperlink to most government sites without first obtaining explicit permission? OPC scheme leaks online before Minister announces it. The internet is here, embargoes don't work. Tough. Embergoes don't work, neither do attempts to prevent people from linking to a published, public internet website. Together, these failures to bring published government websites under some semblance of rational information rights cannot fail to hinder a real engagement of the intended consumers of the information. Fortunately, the way forwarded has been mapped out clearly: with the example set by Whitehouse.gov, and the brave souls who have laboured over the production of the Singapore adaptation of Creative Commons. 12 Ministries that prohibit Hyperlinking without Permission - 75% FAIL! Wording varies, but generally you may only hyperlink to the homepage upon notifying in writing, and for other pages you must make a specific request and secure permission before making a hyperlink. Note that many statutory boards use similar terms. In case you think this may just be a holdover from the internet dark ages, note that all claim to have been "last updated" in the past 3 years, many in 2009.
going open creates the opportunity for unexpected, unplanned innovation (who could have imagined a site like gothere.sg even 5 years ago?). Although SLA talk about wanting to "Start with pilot projects and be quick to scale up" (Mr Lam Joon Khoi, Chief Executive, SLA), by choosing a closed route there is the distinct possibility that quick just isn't quick enough. Rather than harness the collective energies of the technology community in Singapore, it's more likely to see private efforts stalled completely, or diverted into "Do It Ourselves" initiatives (e.g. OpenStreetMap). A largely unsung example of how "open" can work very successfully in Singapore is BookJetty. By opening up it's information services, the National Library Board has provided the opportunity for an individual entrepreneur and technologist to combine government and non-government information and create an amazingly compelling service that is not only relevant in Singapore, but also has a global audience. 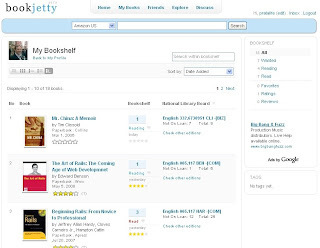 BookJetty is an example of service innovation that the NLB itself could not have attempted. Since the needs that BookJetty serves are at least one step removed from the core mission of the NLB, I doubt they would even be in the position to officially identify and imagine such a service. But by opening their information services to the private sector and individuals, they paved the way for others to innovate in unimagined ways. data accessed through Data.gov do not, and should not, include controls over its end use. This is fundamental to the idea of Government as a Platform. It recognises that government does not have a monopoly on creativity and innovation, and that promoting private sector innovation and entrepreneurship is a priority. Here is an opportunity for Singapore to greatly boost innovation and ecomomic development by giving early priority to openness in all Government data and service initiatives. The community is certainly brimming with ideas (see what was discussed at a recent WebSG meeting for example). Singapore seriously does have a small, but vibrant, technology "startup" community. The Government does a great deal to try and stimulate entrepreneurship in this sector, but I would say the results have been middling at best. The main support is in terms of grants and programs (offered by MDA, iDA, Spring and EDB for example), and the opportunity to secure standard government contracts to work directly for the public sector. ..the programme targets government agencies encouraging them to make available information or services via Web Services. The end result would be citizens making use of richer services via their preferred access points. I guess it boils down to a belief that "Open is Better" when applied to government data and services: both for the benefit of civic dialogue and engagement; and to maximise the stimulus for economic development in the local technology sector. Whether you agree with the priorities I am suggesting or not, I hope most would think that this is an important subject to be discussing.